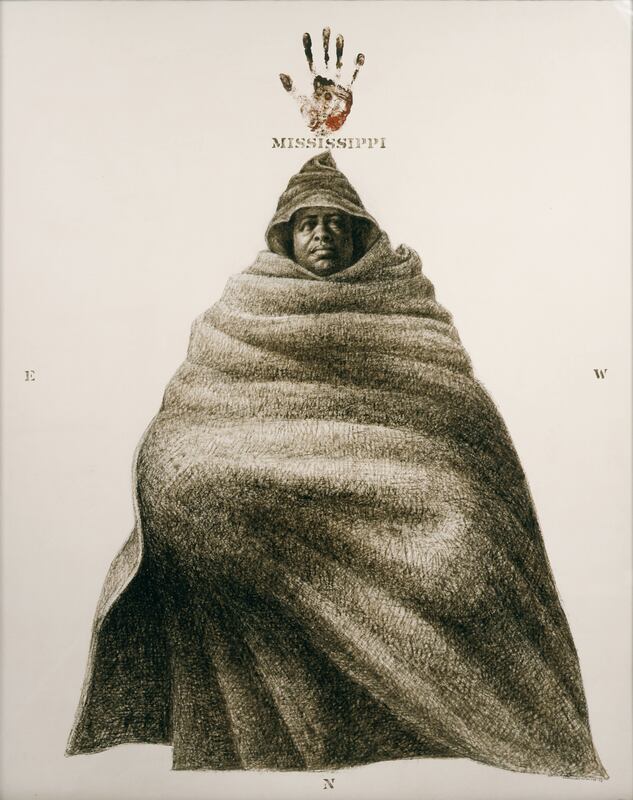 An inverted compass is positioned around the central figure in Mississippi, a visual pun on the symbolism and significance of the north in African American history. Before the Civil War, the north was equated with freedom from slavery, and in later years it was associated with economic prosperity as many southern blacks migrated north for the promise of employment and social freedoms. The story is personal for White, as his mother moved from Mississippi to Chicago in 1914. The inversion of the poles symbolizes the significance of Mississippi for the artist and the centrality of the South for the civil rights movement. Events like Freedom Summer, a campaign to register African American voters in Mississippi, were crucial to the progress of the movement. "Mississippi." Now Dig This! Art in Black Los Angeles, 1960–1980 Digital Archive. Los Angeles: Hammer Museum, 2016. https://hammer.ucla.edu/now-dig-this/art/mississippi.